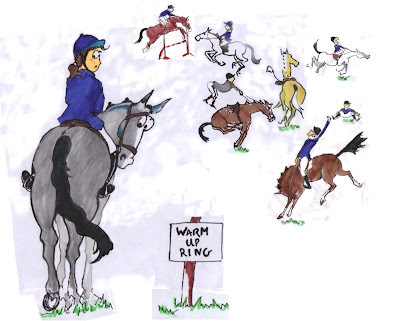 Warm up Ring…/ Practice Ring…. /Collecting Ring…./Hell…..whatever you like to call it yourself. That place you must pass through before you can compete. Take a dozen or so highly strung riders, mix them up adding a smattering of rude, nervous, loud or oblivious character types. Make sure the setting is turned to ‘nerves’ and ‘stress’. Now put the above in a small confined space. Sprinkle with an assortment of people shouting, loudspeakers blaring and dogs barking, don’t forget flag waving. Bake at 100 degrees, if you would rather your warm up be slightly damp, add rain. Serve up with a grimace that can sometimes be mistaken for a grin…..sometimes. Thanks for this! Have missed your wonderful drawings! Hope you're healing alright and can return to the saddle soon, being sidelined is no fun! Haha, love it! We missed your drawings. What a wonderful way to light up a grey day, thanks! This is the cutest blog ever! I love it! I put a link on my post. Tee hee, that could be a recipe for disaster. But a pinch of grin gets everyone through it. Great illustration. Thanks for the hilarity!! Love it. Adding you to my favorites list asap! 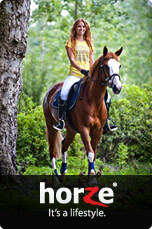 We would love your blog to be featured at http://hay-net.co.uk/ a new Equine Blogging Network for all to follow. Come and join us! This is exactly why I don't show anymore - I can't handle the stress of the warm up arenas, especially when it's a large show! AAYHS at the Ohio State Fairgrounds 3 years ago was one of the most terrifying experiences of my life. I have bestowed on you the Beautiful Blogger Award. 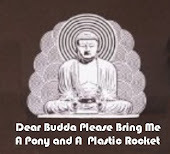 Please visit the Grey Horse blog for details. I know why you haven't been able to update of late but still enjoy your earlier contributions and indeed the continued stories you regale us with on S2S that I couldn't not nominate your blog for a Liebster Award!